You don’t need to wait for the weekend to experience a buzzing market with a hip crowd and incredible food in Cape Town. 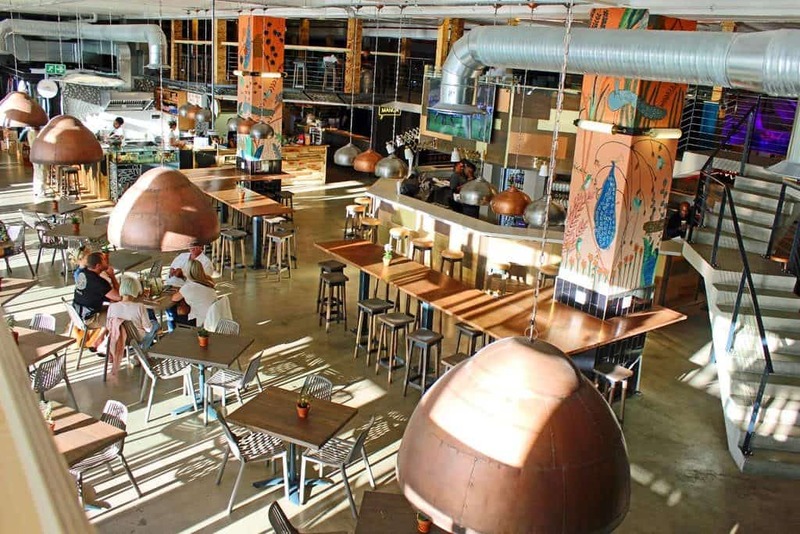 The Mojo Market in Sea Point is open seven days a week and here’s why you should stop by. The Mojo Market is a microcosm of everything Cape Town. You can walk your way through the indoor market and pass a vegan eatery, oyster shop, and bakery to name but a few. The variety of speciality stores is quite a treat, with some focusing on doing one thing beautifully like chicken wings, hummus, or sugarfree, guilt-free baked goods. There’s also bar at the heart of it all so you can get a drink and your pick one or ten of your favourite snacks and sit and enjoy the ambience. The market is open from 11am till 10 pm on weekdays and 10am till 10pm over the weekends so you can stop by for brunch, lunch, pre-drinks, dinners and post drinks (or all of the above). From the guilt-free to the super indulgent, you’ll find a treat for every taste. The popular American ice cream emporium Baskin-Robbins has a stall here right across from a vintage sweet shop where you can buy all kinds of goodies and jaw-breakers. You can get your doughnut fix at the market’s coffee shop that sells baked treats and bagels. If you’re in the mood for something different try a taste of Modern Taiwanese Tea Culture at TeAwesome Tea or a “high-vibe smoothie” at BeetBox RX. The market hosts a range of retailers selling gifts, craft, clothing, accessories, homeware, and shoes. Whether you’re looking for a quirky t-shirt to wear or a gift for a loved one, you’re bound to find something that catches your eye as you browse the market. The venue has a small stage where musicians can entertain the market crowd. Live acts play daily and it’s completely free of charge to attend. The market aims to give local performers a platform to showcase their talent. Live performances take place daily around 7pm and throughout the day over the weekends. Check out the Mojo Market’s Facebook page for updates on who is playing when. The Mojo Market is on Sea Point‘s Main Road, walking distance from other great attractions like the Sea Point swimming pool and Pavillion, the promenade, and Green Point Park. Its neighbouring areas are the City Bowl, Clifton Beach, and Camp’s Bay, so it’s super easy to get to via the MyCiti Bus.